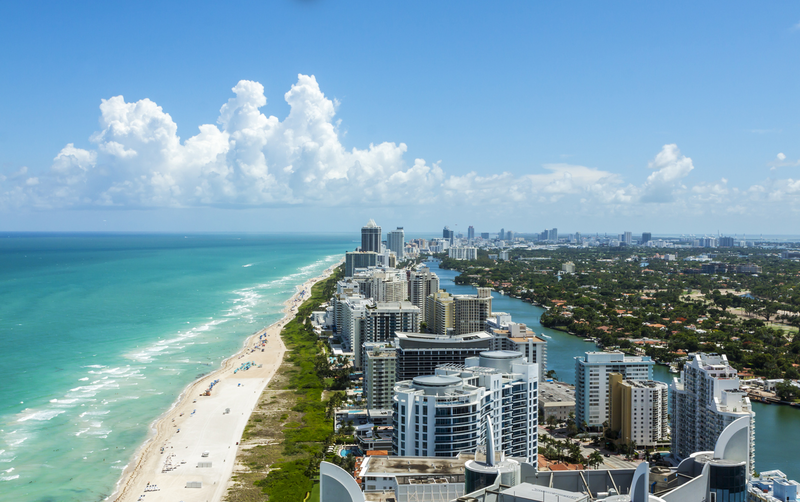 If you're looking for an international escape but want to keep your passport at home, consider planning a vacation to Miami, Florida. The worldly city is located on Florida's southeastern tip. Its Cuban influence is reflected in the cafes and cigar shops that line Calle Ocho in Little Havana. On barrier islands across the turquoise waters of Biscayne Bay is Miami Beach, home to South Beach. This glitzy neighborhood is famed for its colorful art deco buildings, white sand, surfside hotels and trendsetting nightclubs. Glamour aside, the city has plenty of quality restaurants, bars and attractions to appease any budget traveler. Whether you're trying to escape ASAP or you're looking to plan your trip around the future's cheapest fares, take a look at these forthcoming flights between Raleigh and Miami, which we pulled from travel site Skyscanner. We've also included popular hotels, restaurants, and attractions in Miami, to get you started on planning your ideal get-away. The cheapest flights between Raleigh and Miami are if you leave on November 10 and return from Florida on November 13. Delta currently has roundtrip, nonstop tickets for $153. There are also deals to be had earlier in November. If you fly out of Raleigh on November 3 and return from Miami on November 6, American Airlines can get you there and back for $156 roundtrip. Regarding where to stay, here are two of Miami's top-rated hotels, that we selected from Skyscanner's listings based on price and customer satisfaction. The Fontainebleau Miami Beach overlooks the Atlantic Ocean in Miami Beach and the property stands three miles from South Beach and the Lincoln Road shops. There's also the 4.6-star rated The W South Beach. Rooms are currently set at $359/night. If you're looking to snag a bite at one of Miami's many quality eateries, here are a few popular culinary destinations from Skyscanner's listings that will help keep you satiated. One of Miami's most popular restaurants is Joe's Stone Crab, which has an average of 4.6 stars out of 87 reviews on Skyscanner. Another popular dining destination is the Versailles Cuban Restaurant, with 4.4 stars from 94 reviews. You can find the Cuban restaurant in the heart of Little Havana. "Many U.S. presidents have stopped by to experience the restaurant when visiting Miami," wrote reviewer James. Also worth considering is Zuma. Zuma, located in the heart of downtown Miami, offers a menu filled with modern Japanese dishes in a fun and vibrant environment. "Everything is delicious but the stand outs of the night were the miso black cod, the hot pot, grouper tempura, and the truffled beef tataki," wrote Kayla. "I would recommend outside seating if you are with a big group since it can get pretty loud inside." Not sure what to do in Miami, besides eat and drink? Here are two recommendations, provided by Skyscanner. You can take walks through the gardens, spend some time at the waterfalls and fountains, or take pictures at the reflecting pools. "The gardens are lovely and good for kids to run around and get lost," wrote Shane. Then, spend some time at The American Airlines Arena. Since its grand opening in 1999, the American Airlines Arena has become one of the nation's premier facilities in sports and entertainment. "The staff are so helpful and there is a huge range of places to get food and drinks from," Shane said. "I'd recommend walking a few blocks away before calling an Uber."